Current: Young Stroke Survivors Peer-Led Group! 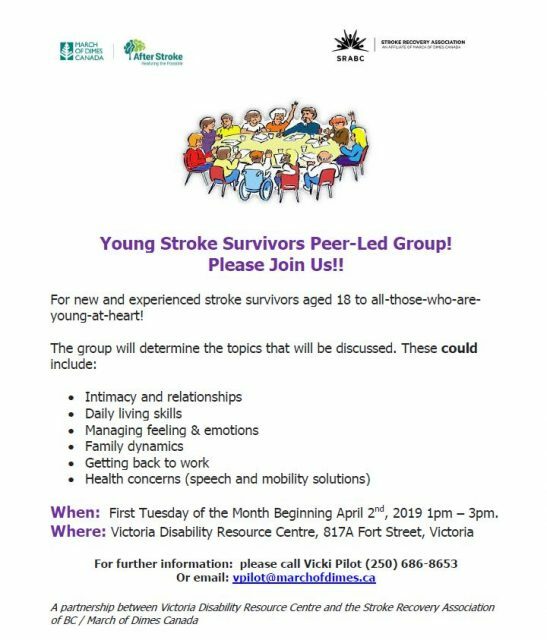 The Victoria Disability Resource Centre and the Stroke Recovery Association of BC/March of Dimes Canada are pleased to announce the Young Stroke Survivors Peer-Led Group! This group is for all those new and experienced stroke survivors aged 18 to all-those-who-are-young-at-heart! When: First Tuesday of the Month Beginning April 2nd, 2019 1pm – 3pm.